Between February 1948 and March 1949 London Transport took delivery of 77 Q1 class trolleybuses 1765 – 1841), which included 1812. These were purchased to replace the ‘Didlers’ and also some experimental trolleybuses and odd vehicles of various classes. 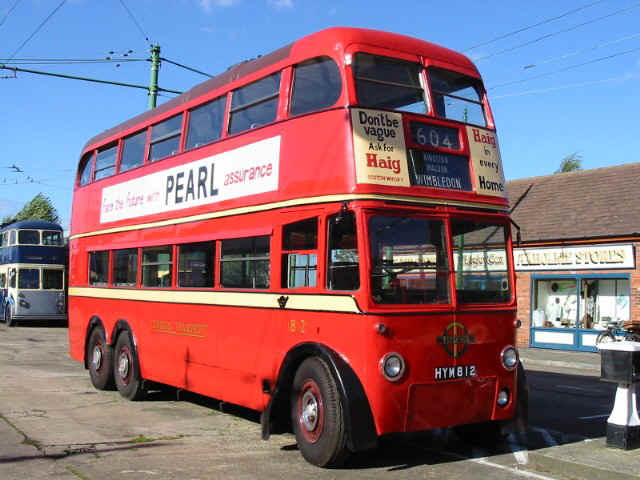 All 77 vehicles were allocated to Fulwell depot and 1812 entered service in September 1948, operating on routes 601-605 eventually. A second batch of 50 Q1s (1842-1891) entered service in 1952 making a total of 127 Q1s in service. In 1954 London Transport took the decision to abandon their trolleybus system in stages from the late 1950s over a number of years although it was originally planned that the Q1’s would remain in operation until at least the late 1960s. In 1960, however, talks were held with trolleybus operators in Spain resulting in the sale of 125 of these vehicles. Withdrawal of the Q1s commenced in November 1960. 1812s claim to fame was that following an overhaul she was temporarily transferred to Hanwell Garage in November 1960 and operated the last trolleybus journey from Uxbridge to Hanwell Broadway on 8 November 1960. 1812 remained in service until 31 January 1961. On 24 February 1961 1812 was towed to St. Katherine Docks and shipped to Spain where she eventually was transformed to become No. 8 in the Santander – Astillero fleet. Following the demise of that system in 1977 the British Trolleybus Society bought her and she was returned to England on 19 June 1977. Much restoration work needed to be carried out, including conversion back from right-hand running, and this was eventually started in 1999. This major project was finally completed in 2001, in time for her re-launch into service at the Spring Bank Holiday of that year. Since then it has been discovered that the differential has too much slack in it leading to excessive wear, so her operating days were scaled down and she was ultimately taken out of service. New differentials were produced by David Brown's of Huddersfield. These were refitted to 1812 in time for her to return to service at the Sandtoft Gathering 2006. 1812 is currently on loan to the London Bus Museum, where it will be displayed until returning to Sandtoft in 2021.